It's Facebook Fridays! for October 19, 2018! Attract luck, love, and money with the powerful assistance of natural magnetism! Magnets produce a strong physical response based on polarity -- which is why we say that "opposites attract." 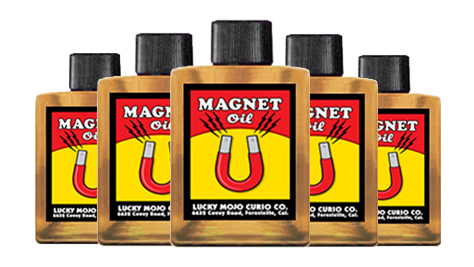 The Lucky Mojo Curio Company is holding a random drawing to give away 8 bottles of hand-made Lucky Mojo brand Magnet Oil, to bring what you seek in the way of physical goods, money, and love when you anoint your Lodestone, candle, your hands, or any other spot influential folks are likely to touch. 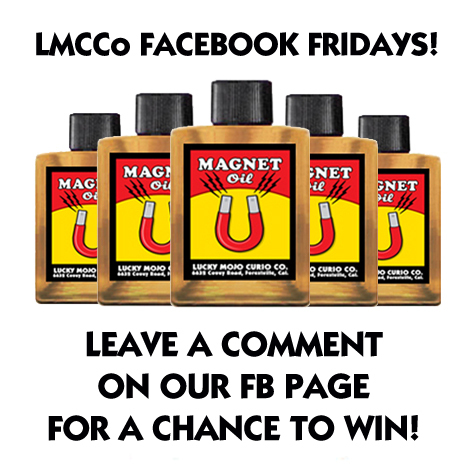 First thing tomorrow morning, we will select EIGHT winners at random, announce their names here, contact them via Facebook to get their mailing addresses, and send them their FREE Magnet Oil. We have a winner! In fact, we have 8 lucky winners! Our Facebook Fridays! winners for October 19, 2018 are: Fergielyn Hagadorn-Aranzazu, Andrea O'Connell, Jennifer Wolf, Simona Somerville, Keith Darensbourg, Catherine M. OBrien, Lauren Ellis, and Aví McBean.